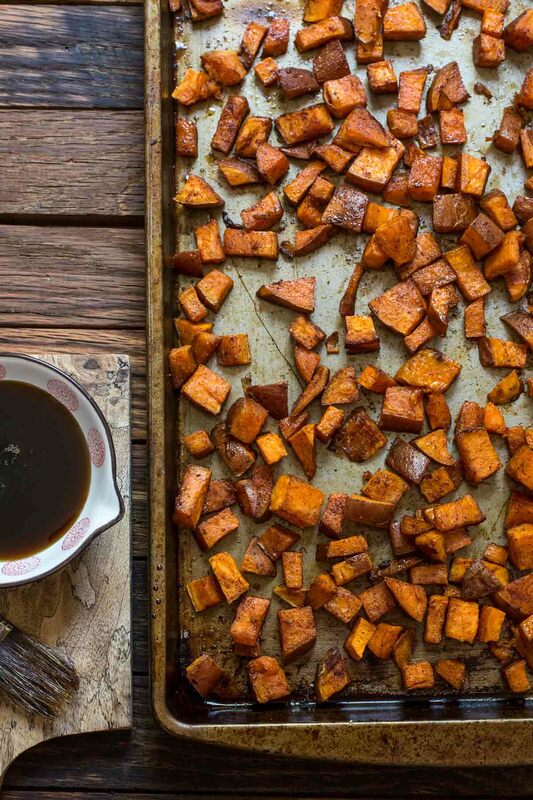 It doesn’t get much easier (or more delicious) than these Maple Roasted Sweet Potatoes. It’s the side dish you’ll want on your table all Autumn long. Sometimes I want my house to smell like Thanksgiving, but I don’t actually want to make Thanksgiving dinner. 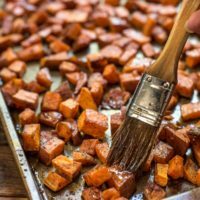 When that’s the case, I just pop a tray of these Maple Roasted Sweet Potatoes into the oven and in 20 minutes my house smells just as fall should–warm and sweet and spiked with cinnamon. It’s the kind of smell that will drive you to your closet to pull out your coziest sweater and then run outside to roll in a pile of leaves. Or maybe it’ll just cause you to wander into the kitchen every few minutes to see how much time is left on the clock. 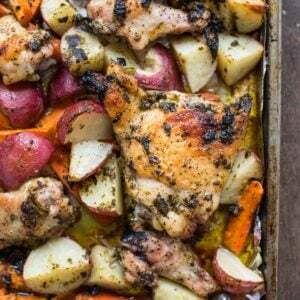 Either way, this is a side dish you’ll want to make over and over again. It’s so simple to prepare, and yields lovely, tender cubes of sweet potato with irresistibly caramelized edges. This is the stripped down version of everyone’s favorite sweet potato casserole. Here, instead of hiding the sweet potato flavor under a mound of brown sugar and marshmallow, we’re enhancing it with just a touch of maple syrup and cinnamon. That, along with a helpful sprinkling of salt, is all that’s needed to make these potatoes shine. Now, a note about oil. I’ve been roasting sweet potatoes for years, but I was never over the top in love with them until I started using coconut oil instead of olive oil for roasting. I’ve found olive oil is a bit too strong and tends to compete with the delicate sweetness of the maple syrup and potatoes. Coconut oil is neutral (don’t worry, it won’t make them taste like coconut), and helps the pure flavor of the potato come through. Feel free to experiment with this recipe to get it just the way you like it. I sometimes cut mine into bigger cubes or into strips to be more like fries (our little guy loves eating them this way). 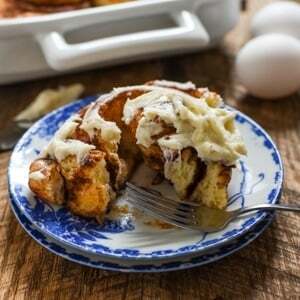 You can also increase the maple syrup for a little more sweetness or add a little smoked paprika to give it a nice smoky sweetness. We like to serve this alongside salmon for a really quick and easy weeknight meal, but they’re also wonderful fried up with an egg and some maple sausage for a lovely autumn breakfast hash. 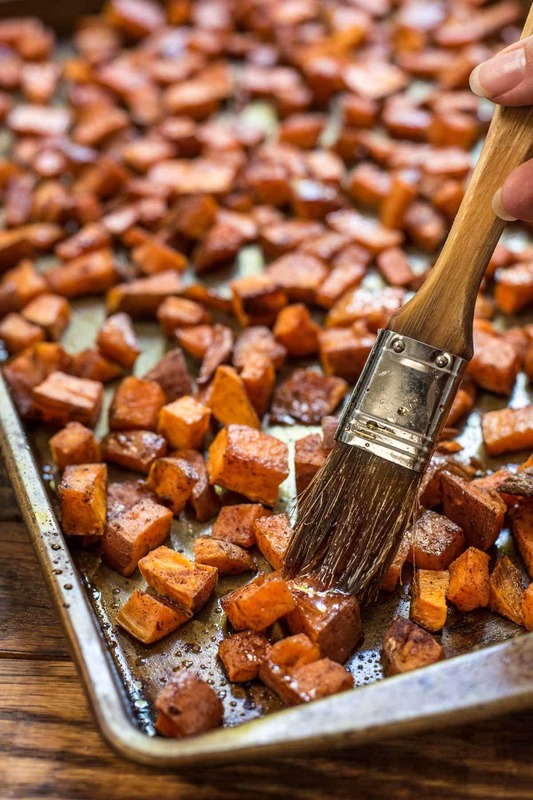 However you serve it, I hope you enjoy these Maple Roasted Sweet Potatoes as much as we do. Preheat oven to 425 degrees. 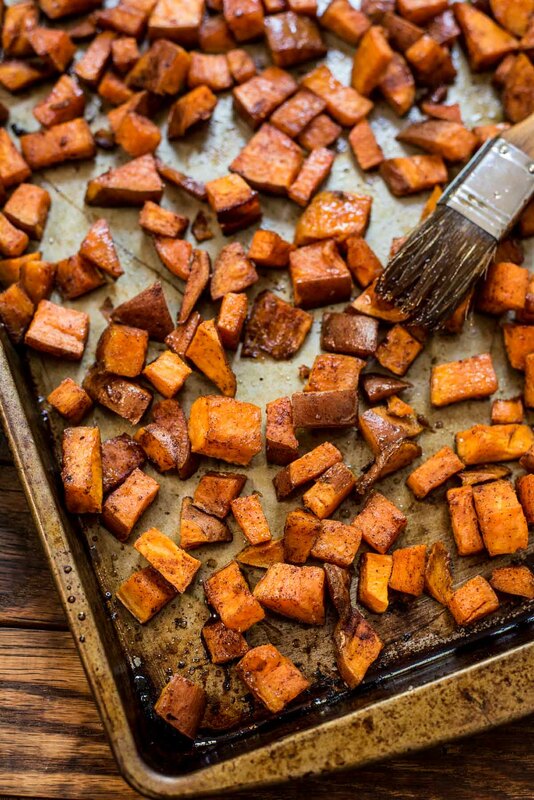 In a large bowl or on your baking sheet, toss the cubed sweet potatoes with the coconut oil, maple syrup, and cinnamon. Spread them out in a single layer on the baking sheet. If you have too many, you may want to use two sheets. Season with salt. Bake for 15 minutes and stir. Rotate the pans if necessary. Bake an additional 10-20 minutes, or until deep brown and starting to caramelize on the edges. You'll need less time for small cubes and more time for larger cubes. I like to take these past the tender part into the really caramely part, so even if they're fork tender you might want to stick them back in for just a few more minutes until you get those lovely brown edges. It's where all the flavor is! Definitely trying those! They look amazing. I love healthy comfort food and these seem to fall into that category. Thanks for sharing!